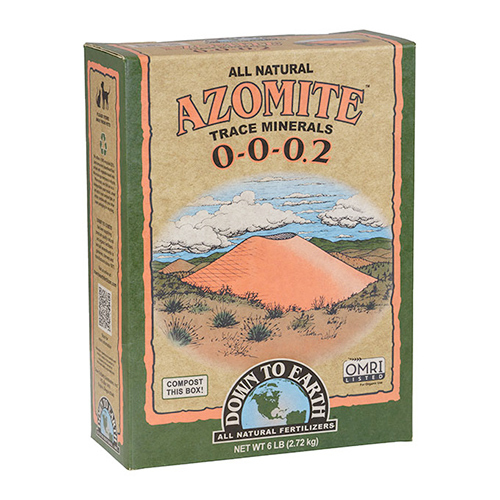 AZOMITE can be described as a rhyolitic tuff breccia, which is a hard rock formation that formed from the dust of a volcano that erupted an estimated 30 million years ago. The deposit resulted from the volcanic ash merging with seawater to form a mineral composition completely unique to its location and circumstance. AZOMITE application could increase the levels of the essential mineral elements and rare earth elements in vine leaves resulting in much stronger and healthier vines and overall improved plant health. Potted plants: Mix 1 tsp. per 2″ pot diameter with potting soil before planting. For houseplants apply 1 tsp. per 2″ pot diameter 4 times each year thereafter.